Day 8 saw intense, focused work as we sequenced our original material to tell our story. Kevin introduced music he had composed for each section. Heather worked frantically to put the final touches on many of the puppets the young people had built, dashing between our workshop construction room and the large cafeteria that was our devising space. 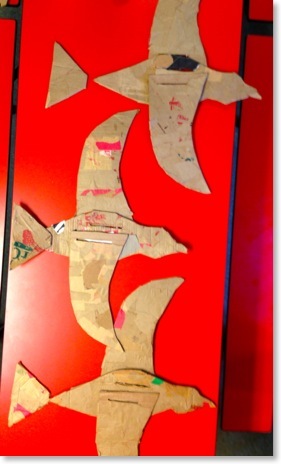 The three of us brainstormed on how we could turn some of the 4th and 5th graders’ ideas for community projects (for example, an eco friendly airport) into black and white object puppets for use in a giant human scale which the young people had created with their own bodies. And whenever we were free, we painted, painted, painted. 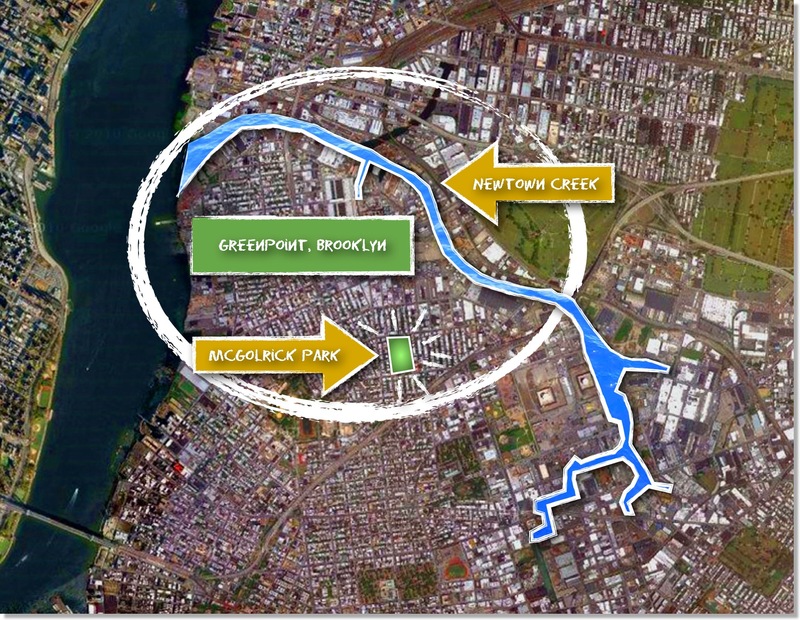 The day’s big discovery: why not try a voice-over edited into the music to tell the story of Part I, “Falling Woman: The Myth of the Creation of Newtown Creek and Greenpoint”? And so Kevin spent the night creating a voiceover track! 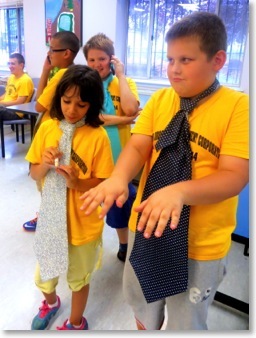 On the morning of our performance, we went outside to the playground at PS 34 and rehearsed each group one at a time. After lunch we brought all of the groups together for a final run through. 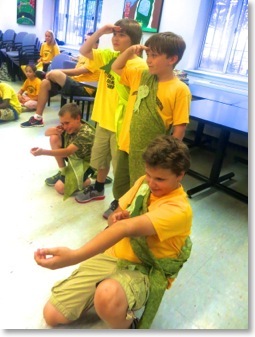 At 3 p.m. the youth picked up their puppets and began parading from PS 34, through the streets of Greenpoint to McGolrick Park. At the park we performed for an audience of over 125 people including youth from School Settlement’s Day Camp, our young people’s family members, friends, and Greenpoint community residents. At 3:30 pm, we performed a three-part show: Part I was a myth of the creation of Greenpoint; Part II was the gentrification of Greenpoint expressed through a puppet dance between trees, houses and skyscrapers; and Part III was a zany Community Participatory Budget Circus inspired by our youth participants’ observations made during a process drama activity earlier in the workshop. To see more pictures from the show click here. This was our time to get feedback from our young participants and find out what they had enjoyed about the project and what they had found challenging. It was also our opportunity to say goodbye and acknowledge the wonderful work the young people had done. Kevin, Heather and Sherry designed short, interactive evaluation sessions that matched the developmental abilities of the participants, since their ages ranged from kindergarten all the way up to 5th grade. With the youngest participants (grades K, 1 and 2), we used a technique called “turn and talk” in which you turn to a partner, discuss a question together, and then share your answer with the larger group if you so wish. With the older participants (grades 3, 4 and 5) we used a fun approach called “graffiti board” in which you write your answers to questions on large pieces of chart paper taped to the walls. 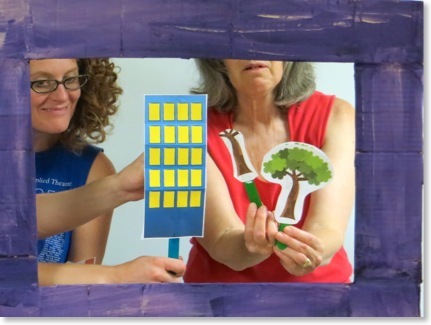 We discovered that many of the older participants were leaving the project with a very different understanding of what a puppet was and how it could be used, as well as with a firm grasp of how to build a puppet from scratch. We also learned that many in the group found paper mâché (which they dubbed “papa macho”) challenging. the most rewarding moment in the day was when the 4th and 5th graders who had participated in a process drama about community participatory budgeting over a week ago demanded to know which community group had been awarded the $1 million which had been at stake. We abandoned our planned session and followed their lead, using a game called “Four Corners” to determine who would receive the funding. The young people decided that the money should go to Greenpoint’s teachers, stating quite clearly that without good teachers, the other interest groups would not even exist! Now that we have our pieces we move on to the next step tomorrow: painting! Day 3: For Today, It’s OK! The challenge for this year’s project is to find active, visual ways to explore and represent neighborhood change – as well as how to balance competing agendas for change. 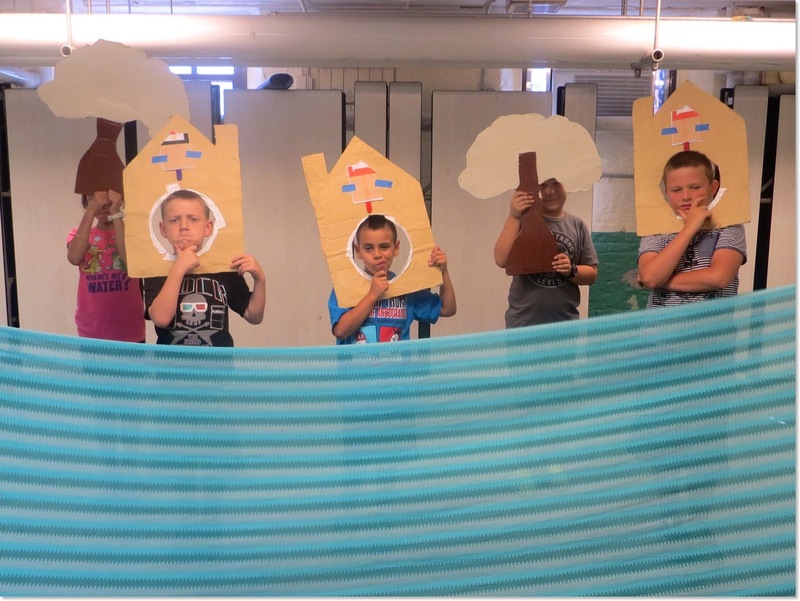 Yesterday’s stick puppet show – which showed a neighborhood in flux growing more and more crowded – clearly started third graders thinking about these issues. "When are we going to start making the puppets?" was the eager question we were greeted with multiple times before the clock had even struck 9 on Monday morning. 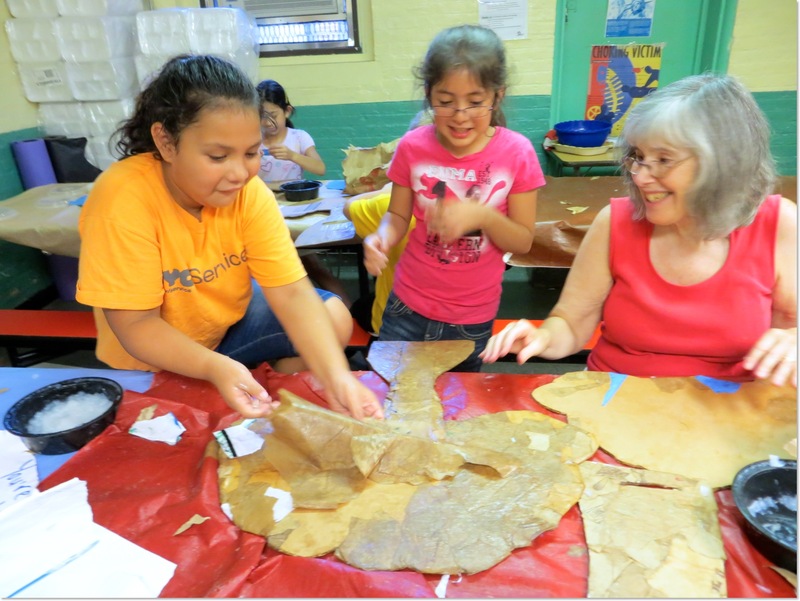 The sight of piles of cardboard, paper bags, and paper mâché paste reminded the returning young people of our puppet making process last year and piqued the interest of new campers as they wondered what creatures we would be creating! 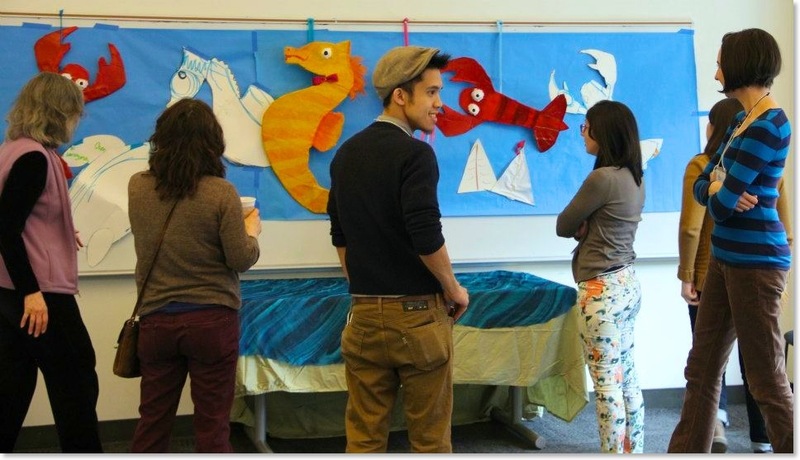 Kevin, Heather and I had a very exciting day on Monday: we visited PS 34 in Greenpoint, where the puppet building, movement and improvisational workshops for Newtown Creek Celebration 2013 will take place during the next two weeks. 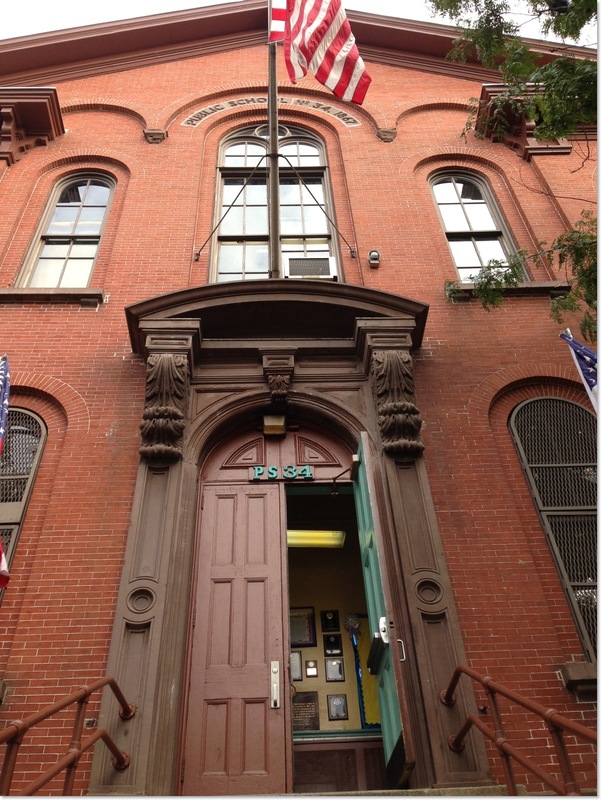 PS 34 is one of the oldest public schools in Brooklyn. It was originally used as a hospital in the Civil War. Behind its brick façade is a rabbit’s warren of irregularly shaped classrooms, sans hallways, arranged railroad flat style. We spent several productive planning hours meeting with our biggest fan, the hard-working, high-energy Kasia Selwesiuk-Swietochowski, Director of the North Brooklyn Development Corporation Summer Camp. After the four of us nailed down the daily schedule and reviewed some preliminary story boards, Kasia showed us the two rooms where we will set up shop. We also greeted the approximately 80 young people who will be participating in the project this summer, as they filed past us in their bright yellow T-shirts on their way to a neighborhood field trip. About half the youth are repeat participants from Newtown Creek Celebration 2012, and they treated us to huge smiles of recognition and enthusiastic hand-waving. We’re all set to co-lead our first workshops in our new digs on Thursday. We will be blogging our progress throughout the project so stay tuned for our next blog entry! 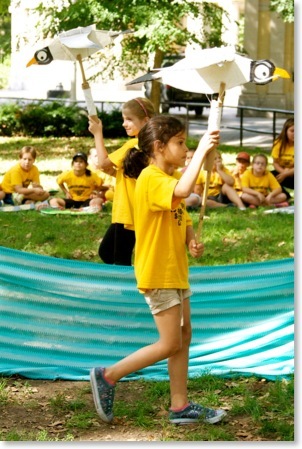 Newtown Creek Celebration is back for 2013 and needs your support. 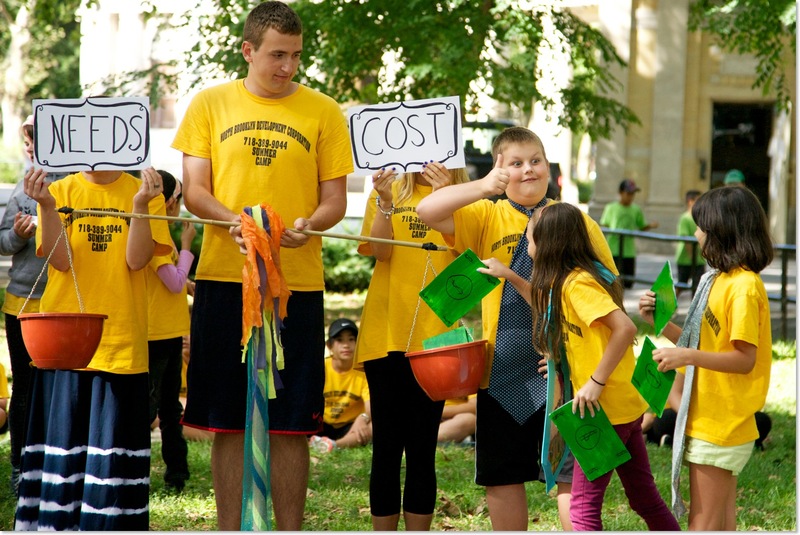 Above is an image from the 2012 culminating event. The project was so successful that we’ve been invited to return! 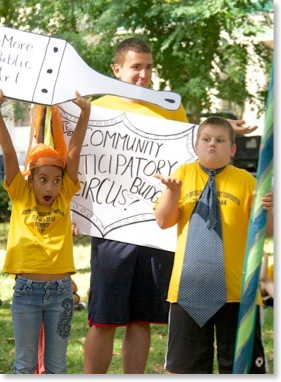 We look forward to two weeks this August full of sparked curiosity, paper mache, movement, story and music, followed by a joyous outdoor celebration in McGolrick Park on August 15th that will captivate neighbors, start conversations between parents and youth, and inspire environmental action! 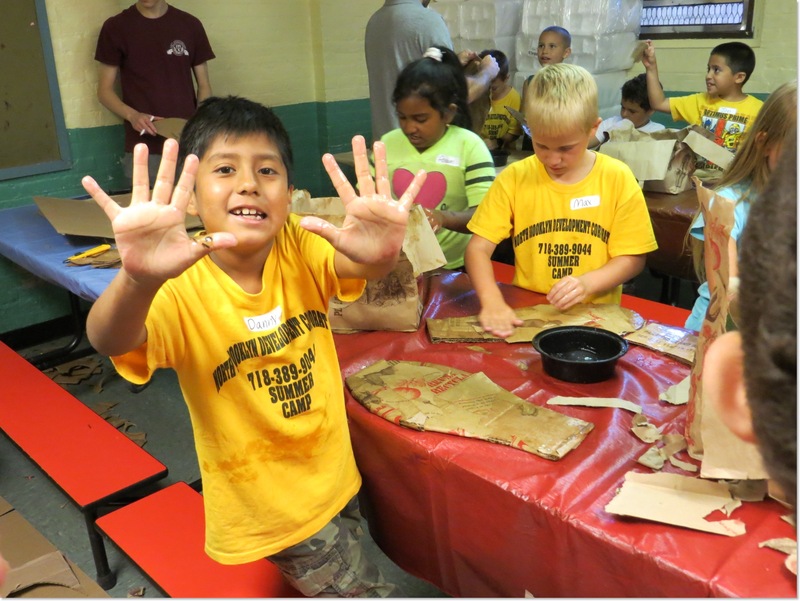 While we are delighted to have received modest funding from the city and state of New York to create Newtown Creek Celebration: 2013, we are still $4,500 shy of the funds we need to start the second year of this free summer program on August 1st. Can you help us? Please click here to view our fundraising video on Indiegogo. 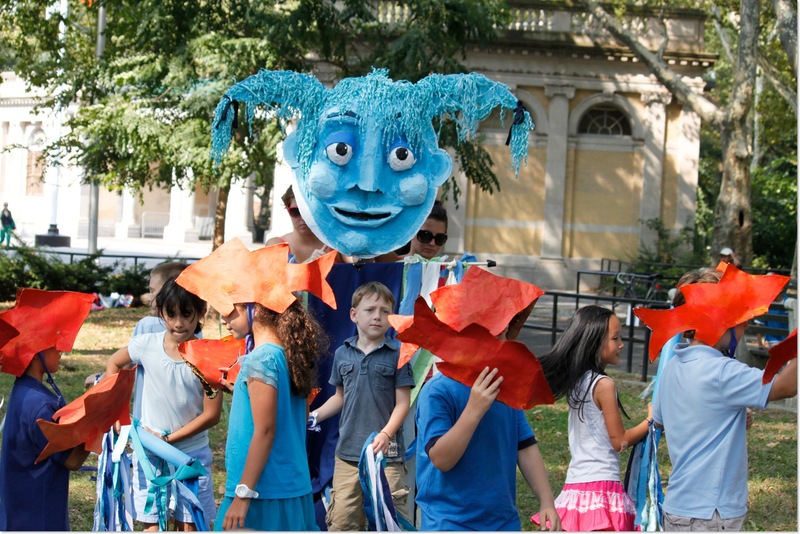 My collaborators, Sherry Teitelbaum, Heather Nielsen and I dreamed up a way to use puppetry, pageantry and parade elements to engage young people with an environmental problem right in their backyard: polluted Newtown Creek. Did you know that 17 to 30 million gallons of oil have been spilled into Newton Creek? Currently, the creek is being cleaned up. But when the cleanup is complete, who do you think will be of voting age to demand public green space? Today’s young people! 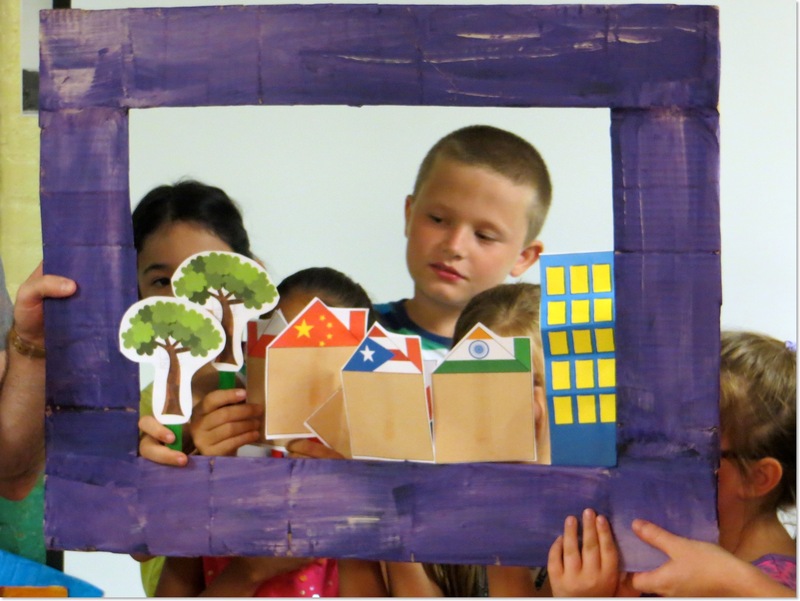 In a fun and creative way, our arts project will begin to plant the seeds of agency in today’s youth. But we can’t do the project without your support. Visit the campaign and make a contribution today by clicking on widget below! And guess what? We have lots of perks for everyone who contributes! Visit the campaign page to see perks ranging from posters, to photos of the event, even a puppet from the show! Visit the campaign and click the share tools right under the video. You can “like” the campaign and send it to Facebook or “tweet” it to send it to your followers. Join us at the final event on August 23rd at 3:30 pm in McGolrick Park, Brooklyn. It’s free and open to the public! Thank you for taking time to read about our project and for visiting our campaign’s website! I look forward to your support and hope to see you in McGolrick park on August 23rd! Send me an email and let me know if you'll be there! 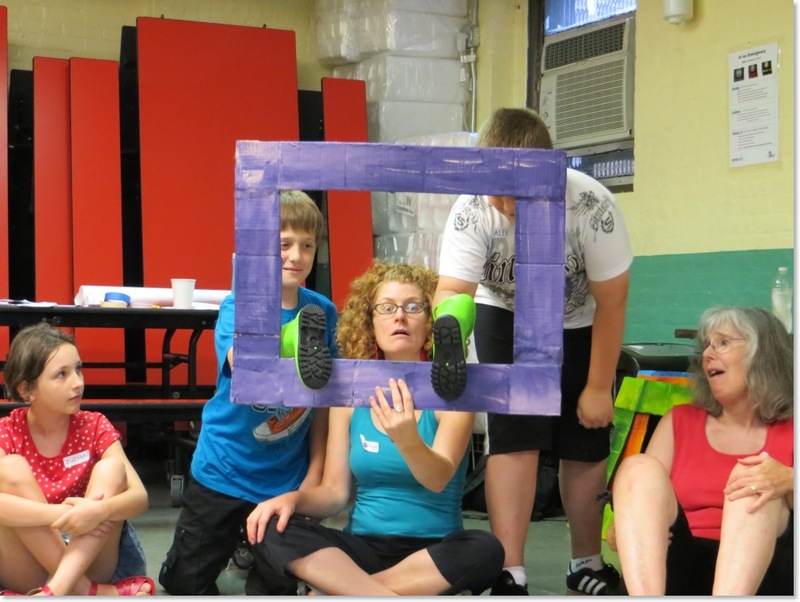 Read about the work happening with people participating in Everybody Act! programs and projects. Join the converstaion about the work in practice by posting a comment at the end of each post! Click the circles below to follow us on the web. Everybody Act! 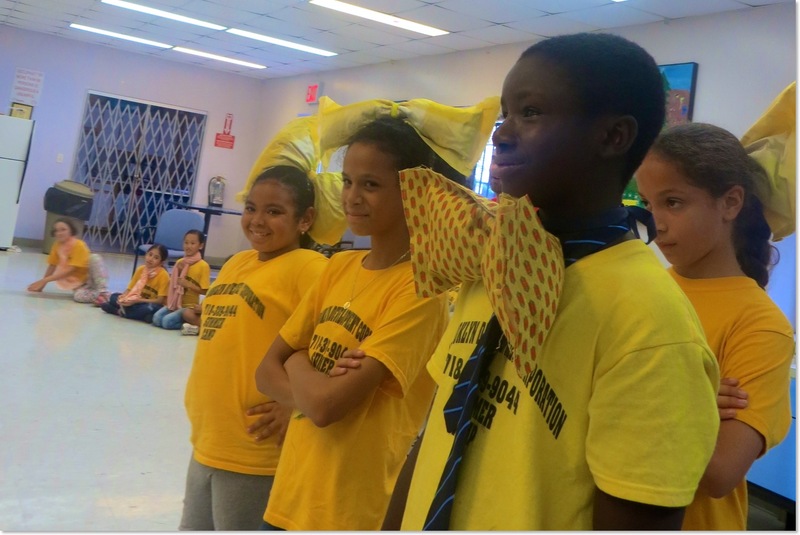 Theater in Education & Communities is a sponsored project of Fractured Atlas, a non-profit arts service organization. Contributions for the purposes of Everybody Act! Theater In Education & Communities must be made payable to Fractured Atlas and are are tax-deductible to the extent permitted by law. To donate click here! Here's a list of other blogs on the web that you might enjoy!